Love is a word commonly used to describe how we humans feel about all sorts of things. Today love is more of a generic term without any specific relevance. Suffice it to say that the word love has lost it’s meaning and it’s significance. There is only one true love and it comes from God alone. God’s kind of love is self-denying, self-sacrificing, and self-giving. It is entirely different from the so-called love being proclaimed today. So what is true love like? God so loved the people of the world that He gave…. He made the ultimate sacrifice when He denied Himself and gave the greatest gift of all: the Son of His love Jesus Christ. The supreme expression of God’s love is the cross of Christ. This selfless act is the pinnacle of God’s love. To thoroughly examine the pinnacle of God’s love—as it is expressed through the cross—is to look into the very core of God’s being. The cross is actually God laying His heart bare before the entire world. God the Father chose to communicate His love to us in the most graphic manner possible, through the excruciatingly painful death of His beloved Son upon the cross. After such a dramatic demonstration, there should be no doubt that God’s nature is love. Truly, “God is love” (1 John 4:8). In light of my own personal pilgrimage that is riddled with sin and shame, I stand in awe of God’s amazing love. Yet, oh—how I thank God for such amazing love that brought about so great salvation, both yours and mine! You see it was God’s love that made it possible for us to be free from our past and enjoy Him forever. Just think—Christ died for you and me! Pause for a moment to reflect upon Jesus Christ taking your place, and dying for your sins. Consider the implications of this. Would you want to relive all the horrible, sinful events of your past? Most certainly not! Yet that is exactly what Christ did for you upon the cross. He felt your pain, your sin, your suffering, and your shame. He became you in every respect, and agonized through every wretched detail of your life. Now, that is truly amazing grace, and it’s motivated by pure, unconditional love. This calls for a celebration of thanksgiving! Please join me in thanking God for the cross, and the love that compelled Christ to go there. Always remember that God loves you very, very much, and the cross proves it. Such true love—selfless love—is also possible in your life. But it can only occur as you allow the Holy Spirit to take complete control of you and produce the fruit of the Spirit of God through your life. Then you’ll have true love, and your actions will prove it! 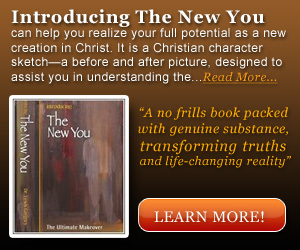 Adapted from Introducing The New You.